This article is the first in an occasional series about the portrayal of women in old Hollywood films. Today, my focus is on Greta Garbo's roles in Anna Christie (photo above) and Camille (1936). 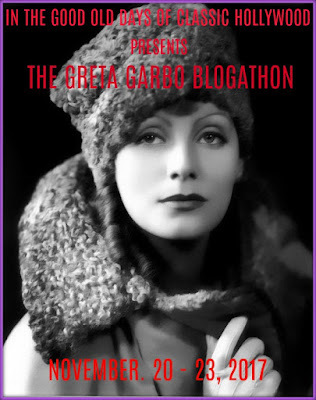 This article is also part of The Greta Garbo Blogathon hosted by In the Good Old Days of Classic Hollywood. Old Hollywood studios made many films that detailed the lives, struggles, and fantasies of their largely female audience, In fact, classic movies present a woman's view in more depth and variation than perhaps any other art form in history. With that in mind, this article is the first in an occasional series that will deal with women and old Hollywood. 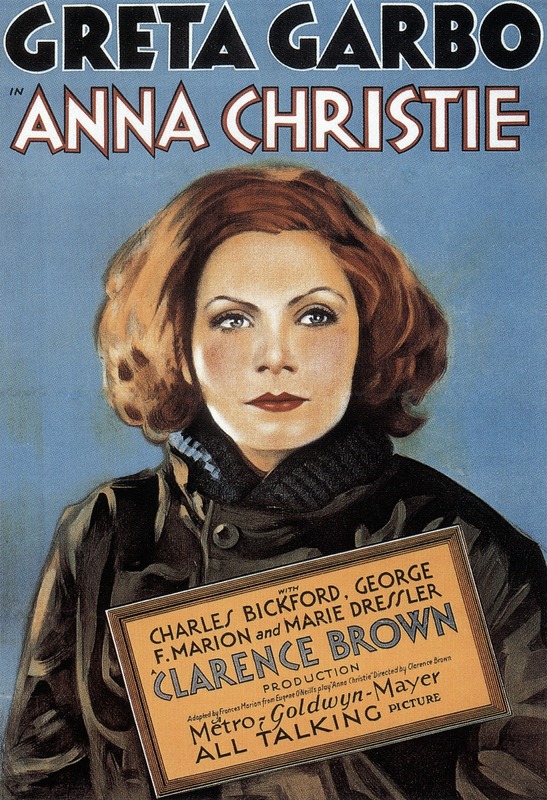 I'm starting out by writing about Greta Garbo in the films Anna Christie (1930) and Camille (1936). Like many actresses in thirties Hollywood, Garbo spent her fair share of time trodding the primrose path. 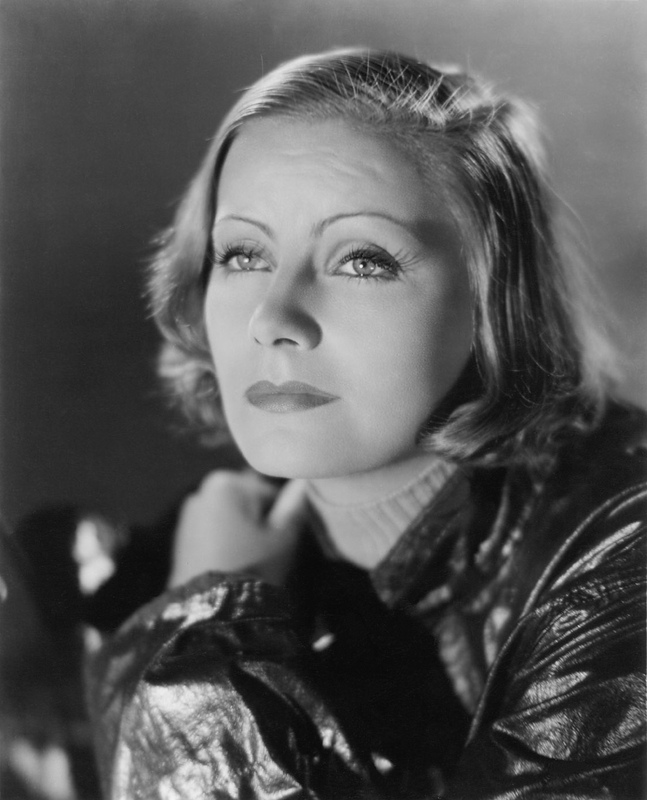 By my count, Garbo played a kept woman in six sound films: Anna Christie; Romance (1930); Inspiration (1931); Susan Lenox, Her Fall and Rise (1931); As You Desire Me (1932), and Camille. Today, I'm writing about the first and the last of these films for two reasons: First, Anna Christie and Camille provide a fascinating juxtaposition between the franker depictions of prostitution in pre-code Hollywood and the more veiled references required by the production code in the later 1930s. Second, both films deal with the humiliation and prejudice faced by even the most glamorous of fallen women in a man's world. Garbo (real name: Greta Gustafsson) was the daughter of a working-class Stockholm family who became a star in Swedish films in the 1920s. She signed a contract with MGM in 1926 and almost immediately became Hollywood's newest Scandinavian sensation. By the end of the silent era, Garbo was MGM's biggest star. Studio chief Louis B. Mayer and producer Irving Thalberg took great care in selecting her first sound film eventually choosing Eugene O'Neill's Pulitzer Prize-winning play Anna Christie, which galvanized Broadway in 1922. Anna Christie had already been made into a 1923 silent film starring Blanche Sweet, but Mayer and Thalberg felt that the play's earthy drama and the title character's thick Swedish accent would be perfect for Garbo's first "all-talking picture." 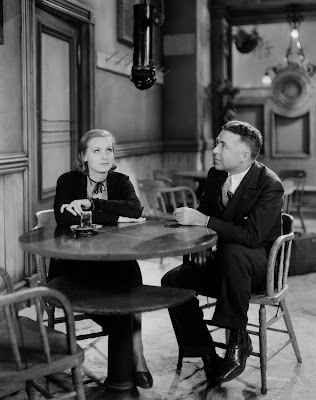 Greta Garbo and director Clarence Brown look at the new studio microphone on the set of Anna Christie (1930). The film begins when Swedish immigrant Chris Christopherson (George F. Marion) receives a letter from his long-lost daughter, Anna (Garbo), who now lives in St. Paul, Minn. Anna tells Chris that she is a nurse who is recovering from a long illness and that she wants to come and stay with him in New York City until she recovers. However, when the world-weary Anna actually arrives at her father's coal barge, she gradually reveals the real horror of her former life. Viewed today, Anna Christie is somewhat talky and stage-bound with the blocking, costumes, and sets all quite similar to photos I've seen of the 1922 stage version. However, the film's great power lies in its sensitive, yet frank script by pioneering female screenwriter Frances Marion and the powerful performances of Garbo and the great character actor Marie Dressler, who plays a broken-down waterfront prostitute named Marthy (Marion cannily beefed up Dressler's role, which gives a deeper resonance to Anna's plight -- at one point Marthy tells Anna "I'm you 20 years from now"). The film's main focus is on Anna, whom Garbo plays with equal parts defiance and despair. Up until the time the film begins, Anna's life has been scarred by unrelenting tragedy. She was abandoned by her father at an early age, abused by the family who took her in, and finally forced to work in a brothel to make ends meet. Anna's suffering has certainly given her a jaded view of what today we would call the patriarchy -- Marion's script is filled with lines like "give you a kick when you're down. That's what all men do" -- but she is no passive victim. Anna bares her soul to her father and fiance (Charles Bickford) in a remarkably raw speech that delineates not only her years of abuse, but also her refusal to allow her abusers to define her own humanity. "I am my own boss," she says in one particularly defiant moment (clip above) and no one who's ever seen the film can think otherwise. Airing at 9 a.m. Jan. 22 on TCM. Available on DVD and video on demand. Garbo made Camille six years later in a very different Hollywood. The Motion Picture Production Code, which took effect in 1934, nixed most overt depictions of the world's oldest profession; in fact, many viewers might not even realize that Marguerite Gautier (Garbo) and her cohorts (Laura Hope Crews and Lenore Ulric) are courtesans. Camille is based on the much-produced play by Alexandre Dumas, fils, that concerns the beautiful Parisian Marguerite, who is known as "the lady of the camellias" because of her preference for the delicate, sweet-smelling flowers. 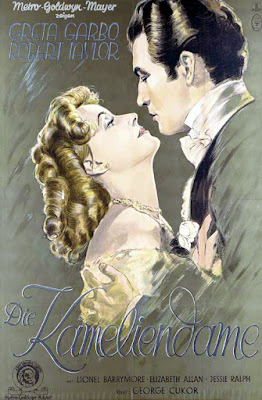 Marguerite is the mistress of the powerful Baron de Varville (Henry Daniell) until she meets a naive young man named Armand Duval (Robert Taylor) at the opera. The pair fall in love and hope to marry, but Armand's family, especially his stern father (Lionel Barrymore), strongly disapproves of the match. 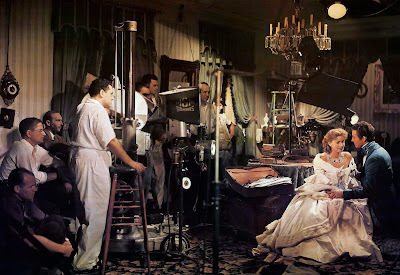 Director George Cukor watches Greta Garbo and Robert Taylor film a scene from Camille (1936). Frances Marion once again penned the script, this time with an assist from Zoe Akins and James Hilton, but Camille trades Anna Christie's raw frankness for a more refined sensibility. Camille is beautiful and witty -- Garbo looks stunning in costume designer Adrian's sumptuous gowns -- but she is also a perpetual victim of the male-dominated society in which she lives. The Baron is generous with money, but also cruel, and Armand, for all of his puppy-like devotion, has a casual indifference that allows him to leave Marguerite for months at a time. Worst of all is Armand's father. He is an essentially good man who wants what is best for his son, but his self-righteous worldview means that he can never see Marguerite as anything but a "bad woman." Monsieur Duval's interference in Armand and Marguerite's relationship sets off a series of tragic events. There are many memorable moments in the second half of Camille, but the one that always stays with me is the scene where Marguerite leaves Armand at the urging of his father. She falsely tells Armand that she no longer loves him and wants to return to her comfortable life with the Baron, but, as she leaves his home, her despair is evident. It will take her some months to die from the tuberculosis that is wracking her body, but, at this point in the film, she is already a defeated person, as crushed and helpless as a faded camellia bloom. Camille is available on DVD. Fantastic post! I’ve seen Camille but I really want to watch Anna Christie now!